Iyama One Win Away From Defending Honinbo Title: The fifth game of the 68th Honinbo title match was held at the Hotel Hankyu Expo Park in Suita City on June 24 and 25. This was another irregular Monday/Tuesday game because of the hectic schedules of both players (Wednesday/Thursday is usual for two-day games). Suita City is in Osaka Prefecture, the home ground of Iyama, so the overwhelming majority of the fans who attended the party on the eve of the game were rooting for him. Takao was unfazed, however. In his speech, he commented that he now understood the feelings of his favourite baseball team, the Chiba Lotte Marines (from the prefecture to the east of Tokyo), when they were playing the Osaka-based Hanshin Tigers on their home ground. His humor may not have converted the fans but it won him generous applause. In reply, Iyama apologized for his inability to think of anything witty to say despite being an Osakan (natives of Osaka are known for their wit and dominate the ranks of comedians in Japan) and said he would make his statement on the go board. As it turned out, Iyama was as good as his word. After a fierce struggle featuring a series of kos, he took advantage of a hallucination by Takao in a capturing race involving yet another ko and took the lead in the ensuing trade (not the first in the game). Takao fought on valiantly, but had to resign after 242 moves. Having taken a 3-2 lead, Iyama has two chances to pick up the win that will complete his first successful Honinbo defense. He had made a good start to the week, but there was even better to come. Iyama Wins 25th TV Asia Cup, Secures Japan Its First International Title In Eight Years: Japan’s last victory in an individual world title came in the 17th TV Asia tournament when Cho U won the final on June 17, 2005. That was a good year for Japan, as Cho had also won the 9th LG Cup on April 20, and the Japanese team won the Nong Shim Cup team tournament, which started in the autumn of 2005 and concluded on February 24, 2006. Since then, however, Japanese fans have suffered so many disappointments that they have scaled back their expectations on the international scene. However, that may be changing with the founding of the national team, known as Go Go Japan. Everyone admits that Japan lacks the depth of China and Korea, especially among the younger generation of players, but things have started to look up with the success of Takao and Iyama in the opening rounds of the current LG Cup. Iyama has followed up his success there with an outstanding performance in the 25th TV Asia tournament, which this year was hosted by Japan and staged at the Hotel New Otani in Tokyo on the last three days of June. Japan’s representatives this year were Yuki Satoshi and Iyama, who took first and second places respectively in this year’s NHK Cup. Both of them won their first-round games, but Yuki was eliminated in the semifinal by Pak Cheong-hwan (or Jong-hwan), a 20-year-old Korean who has established himself as the world’s number one over the last two or three years. He was outplayed by Iyama in the final, however, and had to resign after 198 moves. 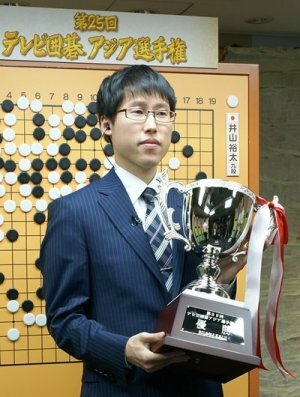 This gives Iyama his first international title (not counting an invitational tournament he won in China May 2001; the games are given in Go World 126). However, Japanese fans will be expecting a lot more from him. - photo courtesy Go Game Guru, which also has a report on the tournament. Round 1 (June 28). Yuki Satoshi 9P (Japan) (W) defeated Jiang Weijie 9P (China) by 2.5 points; Iyama Yuta 9P (Japan) (W) d. Yi Ch’ang-ho 9P (Korea) by resig. ; Wang Xi 9P (China) (W) d. Yi Se-tol 9P (Korea) by resig. Semifinals (June 29). Pak Cheong-hwan 9P (Korea) (W) d. Yuki by 5.5 points; Iyama (W) d. Wang by resig. Final (June 30). Iyama (W) d. Pak by resig. Incidentally, White won all games in this tournament, which is a little unusual. Note that Yi Se-tol took part as a substitute for Pak Hong-seok 9-dan of Korea. As the previous winner, he had a seeded place, but was unable to take part, as he is doing his military service. 38th Kisei Leagues Update: On June 27, three games were played in the Kisei leagues. In the A League, Yoda Norimoto 9P (W) defeated Yamashiro Hiroshi 9P by resignation. Yoda is now 1-1 and Yamashiro 0-2. In the B League, Murakawa Daisuke 7P (W) beat Hane Naoki 9P by resignation and Kono Rin 9P (W) beat Mizokami Tomochika 8P also by resignation. That made Murakawa, now on 2-0, the sole leader of the league, but it was for only one day. On June 28, there was a somewhat surprising result when Cho Chikun, 25th Honinbo, (W) defeated Takao Shinji 9P by half a point. This may sound a little disrespectful towards Cho, who is one of the all-time greats, but he is already 57, so one would have expected Takao to beat him. Takao doesn’t seem to have maintained the outstanding from he displayed in the LG Cup. (This game was played on a Friday, which is unusual, to give Takao more time to recover from the Honinbo game at the beginning of the week.) As a result, Cho joined Murakawa at the top of the B League. Japan Eliminated From Asian Indoor And Martial Arts Games: The first five rounds of the individual men’s championship and the Pair Go in the 4th Asian Indoor and Martial Arts Games were held on June 30 and July 1 in Incheon City in Korea. In the former event, 22 players from 11 countries took part. Tsuruta Kazushi 2P scored 2 wins to 3 losses and Sada Atsushi 1P 3-2 in the Swiss System preliminary round (Sada beat Tsuruta in Round 5), but both were eliminated, as only the top four players qualify for the final round. In the Pair Go preliminary round, also a Swiss, the team of Okuda Aya 3P and Hirata Tomoya 3P scored 3-2, as did Rina Fujisawa 1P and Motoki Katsuya 2P. Both teams were eliminated. The final rounds of the above tournaments will be played on July 2.